Before I Go To Sleep . . . I must tell you to go see this crafty little thriller. From the opening, it felt like a cross between Memento and 50 First Dates. Especially when Christine’s (Nicole Kidman) husband Ben (Colin Firth) had to introduce himself and explain her condition. I loved the fact it got straight to business. Presenting a dozen questions and leaving you just as baffled as the protagonist. It established the set up quickly and set the game afoot as Christine tried to piece together her memories. The initial sequences in which Kidman is re-told the same story, only for her to forget again were a little repetitive. BUT you felt for Christine and also her husband. Reliving the same thing day after day. Thankfully, things picked up when Dr Nash (Mark Strong) made an introduction. Strong delivered a sterling supporting turn in the minute role. Providing Christine with a video camera to record her thoughts at the end of each day, hoping to improve her memory (Pretty much like Memento minus the Polaroid. Ironically, snapshots were plastered all over the bathroom wall). As she digs deeper, little flickers and images trigger more memories. With thrillers, it’s always a tough one. To get characters you care about. Mysteries that intrigue. Twists that make sense. And an ending that doesn’t spoil it all. The cast were superb. Nicole Kidman was finally given a better character with a far better story to work with. Delivering another underrated performance. She had great chemistry with the scene stealing Firth (Reunited after their fantastic turns in The Railway Man). The premise was hardly original. BUT the unravelling and mystery element of the film was highly watchable as Christine gets closer and closer to the truth. Director Rowan Joffe (28 Weeks Later/The American) excelled in delivering the suspense and tension. Once the BIG TWIST (Don’t worry, NO SPOILERS) was revealed, I still found myself surprised. The twist may have been slightly obvious but it was HOW that twist was revealed that won me over. Earning its plaudits. It also allowed for a tense and nail biting finale. This was never going to top Memento. An exceptional thriller. BUT this film certainly made my contender list for the top films of 2014. 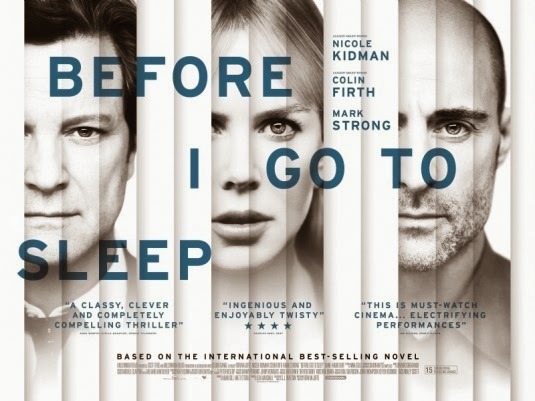 A well acted and taut thriller that makes this one not to forget.